Director – J.A. Bayona, Screenplay – Patrick Ness, Based on the Novel by Patrick Ness (From an Original Idea by Siobhan Dowd), Producer – Belen Atienza, Photography – Oscar Faura, Music – Fernando Velazquez, Visual Effects Supervisor – Felix Berges, Visual Effects – Lamppost, Minimo VFX, Miopia (Supervisor – Jose Rossi), MPC (Supervisor – Ferran Domenech) & Ranchito, Animated Stories – Glassworks Barcelona (Supervisor – David Gomez), Special Effects Supervisor – Pau Costa, Makeup Effects – David Marti & Montse Ribe, Production Design – Eugenio Caballero. Production Company – Apaches Entertainment/Telecinco Cinema/A Monster Calls AIE/La Trini/ICAA/ICEC. At school, Conor O’Malley is bullied, while at home he is not wanting to face the fact that his mother is dying of cancer. While Conor sits drawing at 12:07 at night, a tree in the nearby churchyard comes to life as a giant monster and then comes to talk to him. The monster tells Conor that it is going to tell him three stories and that Conor will tell it the fourth story. At the same time as his mother goes back into hospital and he is taken away to live with his grandmother, Conor tries to make sense of the contradictory messages within the monster’s tales and apply them to his own life. A Monster Calls (2011) was an illustrated children’s book by British writer Patrick Ness. Prior to this, Ness had enjoyed some success with the Chaos Walking series of books set in a future where everyone can hear everyone else’s thoughts. A Monster Calls was originally conceived by British children’s writer Siobhan Dowd while she was suffering from cancer. After her death in 2007, Ness took on the job of writing the book and it was published accompanied by a series of striking black-and-white illustrations from Harry Potter artist Jim Kay. The book enjoyed enormous acclaim upon publication and won a host of major children’s book awards. A Monster Calls is the first of Ness’s works to be adapted to the screen, although Doug Liman is currently making the upcoming Chaos Walking (2019). Ness writes the screenplay for the film adaptation here. Elsewhere, Ness served as the producer and writer of the short-lived Doctor Who spinoff series Class (2016). Spanish director J.A. (or Juan Antonio) Bayona caught attention with his debut film, the ghost story The Orphanage (2007), which gained considerable international acclaim. This lead to Bayona’s second film, his English-language debut with The Impossible (2013), a drama set around a tsunami. Both of these films have enjoyed considerable acclaim with Naomi Watts been nominated for an Academy Award in the latter. A Monster Calls was Bayona’s third film. He subsequently went on to make Jurassic World: Fallen Kingdom (2018) and has also produced the horror film Marrowbone (2017). In his script for the film, Patrick Ness closely replicates the detail of the book, although there are some notable differences. My major disappointment was with the bringing to life of The Monster. Do a Google image search for Jim Kay’s artwork – all in black-and-white, it is stark and extraordinary, somewhere between the Expressionism of The Cabinet of Dr Caligari (1919) and the work of Edward Gorey. Seen in colour and brought to life by CGI, the film’s monster seems somewhat the lesser. The first images of it as a giant CGI tree tearing itself out of the earth and its insides coming to life with an inner fire seem to lose what was so effective about the original illustrations. In these first scenes, you are uncomfortably aware that what you are seeing before you is a CGI creation, which tends to wrench you out of the crucial suspension of disbelief the film should engender. The monster does settle in by some of the later scenes and there are striking images of it against the house. On the other hand, none of these approach the effectiveness of Jim Kay’s drawings. You suspect the best vehicle for the telling of the story would actually have been as an animated film. The French animated black-and-white horror anthology Fear(s) in the Dark (2007) has much more of a sense of what you suspect Kay intended. 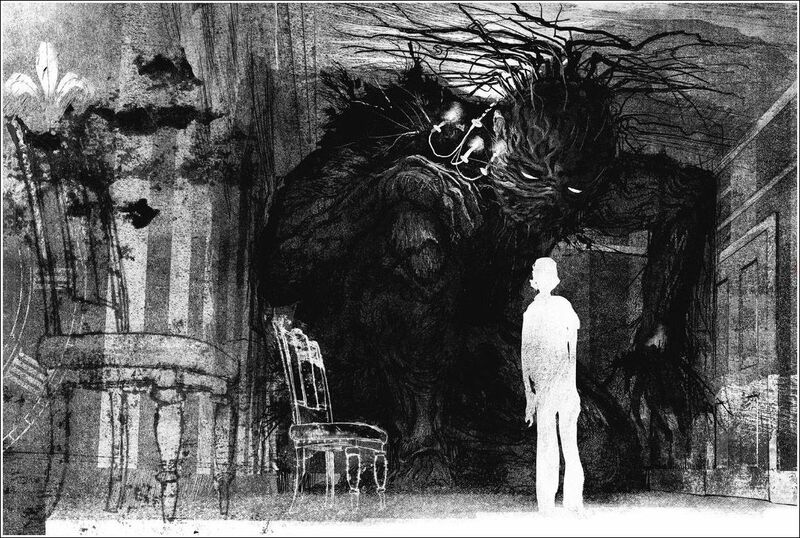 The one thing you must commend about the film though is the beautiful watercolour animated tales told by the monster. That said, the film works well enough on its own terms. J.A. Bayona has a feel for the matter-of-fact Englishness that is an essential part of the book. All of the performances are impeccable, even if it is a little jarring watching Sigourney Weaver affecting a British accent (why did the film not cast an English actress in the part you keep wondering?). Lewis MacDougall is definitely a young performer worth keeping an eye on. A Monster Calls is a film that delves into some incredibly dark places for a children’s film – indeed, there are times where you are left to wonder if what you are watching is a children’s film or one that is made for adults. Ostensibly its themes – the child protagonist, their bildungsroman, the threateningly friendly monster – are classic children’s material but it is hard to imagine children looking to the film as entertainment (I may be wrong), whereas it plays out more aptly as a work made for adults. Bayona has his finger on the emotions and sweeps the film along to its saddening conclusion. It felt like a film where from the outset you suspect that you are going to be crying by the end. On the other hand, maybe the flaw comes in that Bayona carries us to the threshold but not quite across into that outpouring of emotion.